Facebook Like Box is an easy way to promote your Facebook Page and convert your customers into engaged fans. Creating a customized Like Box on your WordPress website by displaying the more information about current events, latest posts and feel the power of social networking site. Why should you use Facebook Like Box? Facebook Like Box allows website owners to provide their user an easy way to join their facebook community and display your facebook content on site. It makes your website more social and increases interaction between you and your users. Plugin helps to display content from your Facebook page to your site with full control. Provide all the updates to the users about your latest events and post, without leaving your site. Facebook is a social media giant, and most visitors of your site use it on a daily basis, so it's the easiest and fastest way to interact with your users, which helps build trust and credibility. Facebook Like Box display a responsive Like Box on website, which helps to get more likes for the Facebook Page. Without facing any issue it perfectly moulds into the screen of your device. How to Configure Facebook Like Box? Facebook Like Box convert your WordPress site traffic to your facebook fan page, and it also helps to built trust within your customers. Using this plugin you have full control over the content of the facebook page that which you want to show or hide from your visitors. It allows to embed & promote your facebook pages on your site. To configure facebook page on your site, to provide specific Facebook Page URL or Page ID that you want to display. You can show / hide various attributes such as cover photo, latest posts, user faces, events, messages. Also customize the style of the border of your Like Box. A single click on the Like button will like pieces of content on your website. It also allows you to select an action as like or recommended. You can easily configure the size ( large / small ) of the button with different button styles such as standard, box count, button count, button. You can also hide / show the share button on your Facebook Like Box. It display the Facebook Like Box in the sticky box which sticks to the side of your site as the user scrolls. 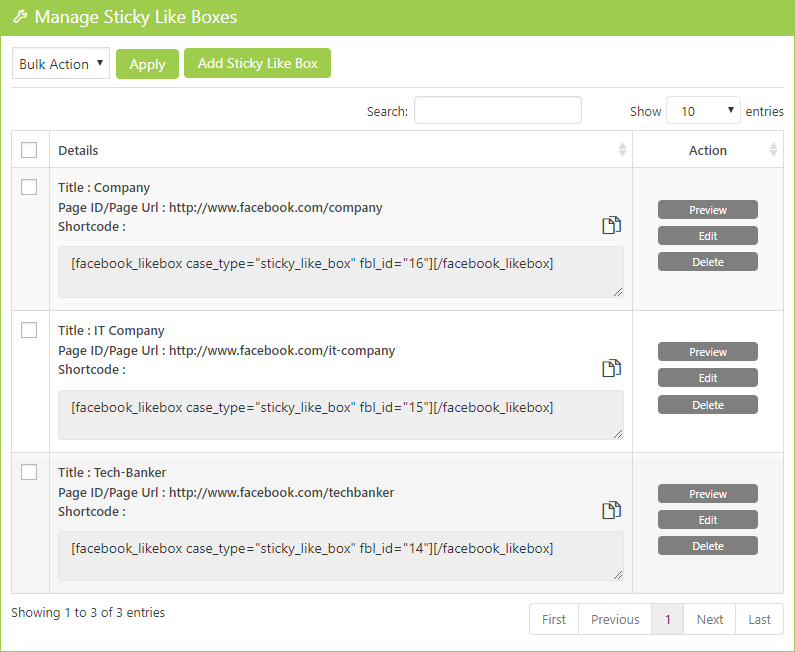 You can set the position of Sticky box as left, right, top or bottom of your website. It provides the option to display the post stream, events, and messages and also hide the user faces and cover photo in the Like Box. When someone visits your website, a popup box open with your Facebook Page Like Box which helps to promote your Facebook page and encourage visitors to connect with you on facebook. It is possible to choose how frequent Like Box Popup will appear for the same website visitor. It could be either one time or every time. You can configure the dimensions of Like Box popup by choosing width and height and also customize title, border, and overlay color. Facebook Like Box an easy and efficient way to integrate facebook with a great number of features. People who visit your page will see a count of users that like the page as well as their profile photo. You can also add share button along with the Like button and also provide counter functionality to the button. You can decide which action you want to perform on the button it would be like or recommend. You can also configure the event & messages option by simply selecting enable or disable. With this option, you can show the current events and messages on the like box which allows to keep users and visitors aware. Facebook Like Box allows you to perform different actions such as edit, delete the Like Box. You can edit and delete your Like Box on a single click. There is another advanced option available which helps you to preview your Like Box & it verifies how your Like Box looks on the website. 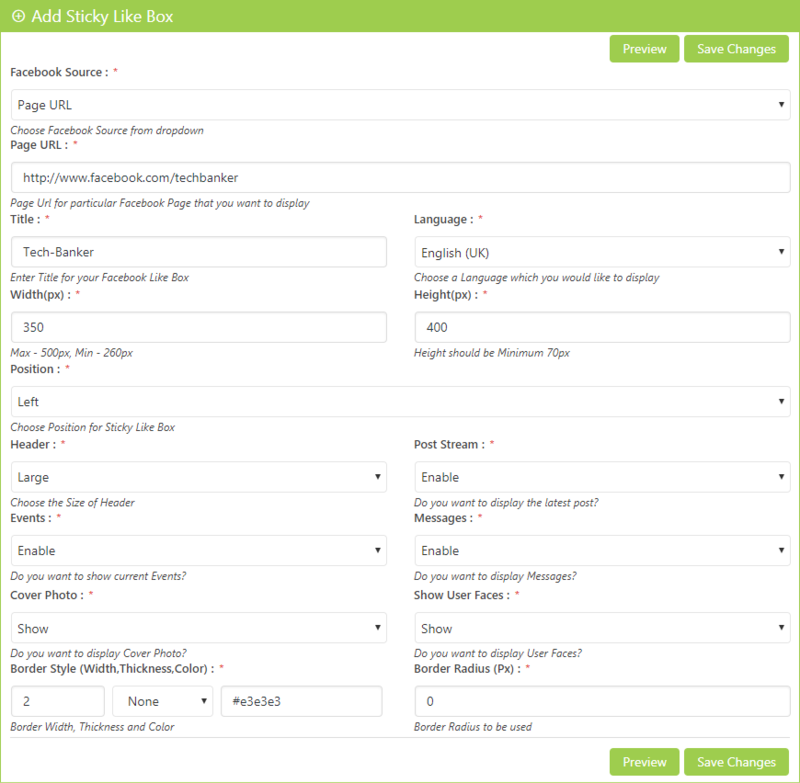 You can also preview your Like Box before and after saving and also edit it as your requirement. 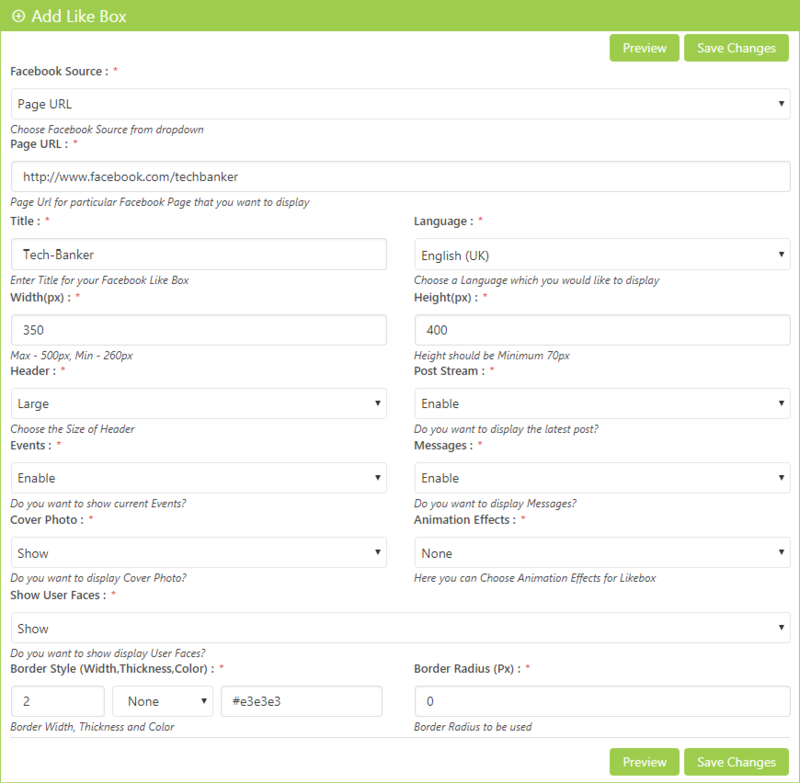 Plugin provides a wide range of customization option to ensure that your Like Box doesn't look boring. You can easily customize border and background colors, font sizes and much more to completely adopt the plugin to better fit your website. Facebook Like Box comes with a number of styling and customization options. You can easily customize border and background colors, font sizes and much more to completely adopt the plugin to better fit your website. You can embed any Facebook page into your WordPress post, page or widget using the shortcode given in your Like Box. 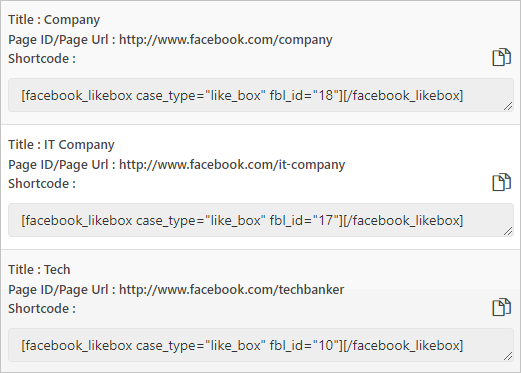 Simply put the copied shortcode in your page / post and show your Facebook page to your visitors. You can also add the shortcode by just clicking on Add Shortcode button in page / post and select the Like Box which you want to display. Widgets allow you to display a Like Box in your sidebar or footer. Facebook Like Box widgets are already available in your widget section, just add the widget to your footer or sidebar section and select your Like Box from the drop-down list. Facebook Like Box provides an easy way to embed and promote your facebook page and get more Facebook fans, social shares, and likes. Along with our key features, we have much more for you which makes Facebook Like Box plugin more unique. Do you have a question about Facebook Like Box? See the list below for our most frequently asked questions. If your question is not listed here, then please contact us. On How Many Sites Can I Use Facebook Like Box? You can install Facebook Like Box on Unlimited Sites. You will get a notification about the Facebook Like Box in your WordPress Back-End whenever an update is available. You can expect that Facebook Like Box will get improved, optimized, and bug-free plugin every time you will update. A change log about various updates is available on our website. Facebook Like Box Pro Edition offers you Full Features, Support & Updates for Unlimited Sites. Facebook Like Box Developer Edition offers you Full Features, Support & Updates for Unlimited Sites with Contact Bank, Backup Bank, Gallery Bank, Coming Soon Booster & Captcha Bank Pro Edition. 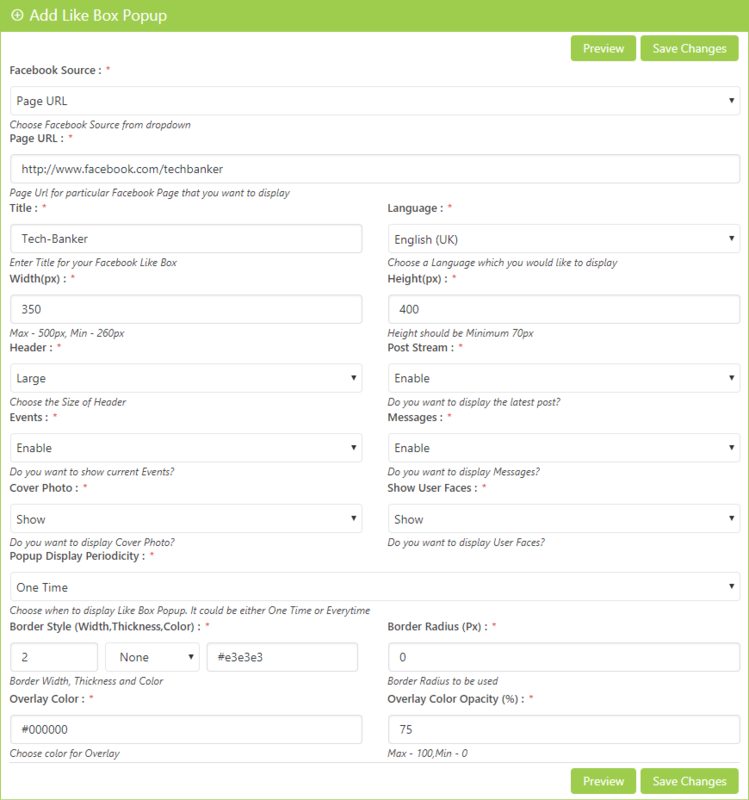 Whereas Agency Edition offers Full Features with Support & Updates for Unlimited Sites with Captcha Booster, Clean Up Optimizer, Coming Soon Booster, Contact Bank, Gallery Bank, Google Maps Bank, WP Mail Bank & Limit Attempts Booster Pro Edition. We firmly believe in and stand behind our products 100%.But we understand that it cannot work precisely for everyone.If you are unhappy with your purchase, we will gladly refund your money.You can apply for a refund within 14 days of purchase [ Terms & Conditions Apply ]. Make your Website more social with Facebook Like Box!